April is poetry month and congratulations to Sina Queyras for winning the 2013 Pat Lowther Memorial Award for her book of poetry Lemon Hound. And, while this is a fairly gruesome story, it’s a murder that captured my attention when I was writing At Home with History. Patricia Lowther died in September 1975–her head smashed in with a hammer at her East Vancouver home. A noted, but fairly obscure poet with a lover and a jealous husband, Lowther, for a time was far more famous in death. Pat, who was just 40 at the time of her murder, grew up in North Vancouver. The Vancouver Sun published her first poem when she was 10. She published her first collection of poems in 1968, she taught at the University of BC’s creative writing department, she was the co-chair of the League of Canadian Poets, but her most well-known work–A Stone Diary—wasn’t published until after her death. At the time of the murder, Pat’s husband Roy Lowther, 51, was a failed poet and teacher. His first wife divorced him in 1963 shortly after he assaulted her. He married Pat that same year. They had four children, two from Pat’s previous marriage. 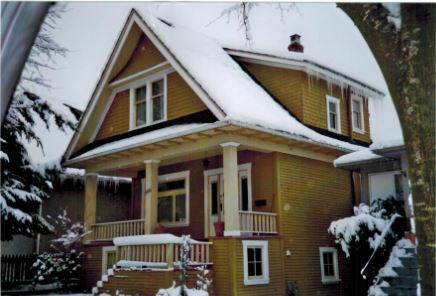 The mustard-coloured house where Pat and Roy lived near Mountain View Cemetery, is an old, three-storey, classic kit home with a welcoming front porch and stained glass on the front door. A church graces the end of the street and the pleasant neighbourhood seems like a place where bad things don’t happen. A week after she’d last seen her mother, Pat’s daughter Kathy went to police and reported her missing. Roy told police that his wife was having an affair with a poet in Ontario, and he assumed she’d gone there to be with him. Police checked airlines, rail and bus companies—no one had seen her. Three weeks later, a family hiking at Furry Creek found her body lying face down in the water–her head and shoulders jammed under a log. The body was badly decomposed and policed identified Pat from fingerprints and dental records. An autopsy found the cause of death was a blow to the head so hard that it had smashed in her skull. Police found a blood stained mattress and a hammer at the Lowther’s house on Mayne Island. A search of the couple’s bedroom in Vancouver turned up 117 blood spots on the wall. Roy was charged with murder. Roy’s lawyers put up a fascinating defence. Roy admitted to finding his wife’s naked, battered body in the upstairs bedroom. He said he assumed one of her lovers had murdered her, and that as the husband, police would suspect him. He decided to get rid of the body. First, he stowed her body on a chair in an unlocked closet so his two young daughters wouldn’t see it, then at 3:00 a.m. he carried it down the back stairs and out to the trunk of the car. He went back to the bedroom to pick up the bloodstained mattress and the clothes he’d used to wipe the blood from the walls and ceilings. Finally, he drove to Furry Creek, threw his wife’s body over a cliff and hoped it would stay hidden. “It dropped away and came to rest on a rock about three feet above the waters of the stream,” he told the jury. Roy was convicted of his wife’s murder in 1977. He died in prison in 1985, two years before coming up for parole. The League of Canadian Poets established the Pat Lowther Memorial Award in 1980 to honour a new book by a Canadian woman poet. © All rights reserved. Unless otherwise indicated, all blog content copyright Eve Lazarus. Eve Lazarus is a writer with a passion for history and heritage houses. She is the author of Sensational Victoria: bright lights, red lights, murders, ghosts & gardens; and At Home with History: the secrets of Greater Vancouver’s Heritage Houses. Eve blogs obsessively about buildings and their genealogies at www.blog.evelazarus.com. I am a Dutch writer and I wrote on the same day a memorial-hommage for Pat Lowther, what will be publiced on “Nederlands.nl”, a site for Dutch literatury and poetry. It is indeed a beautiful house with a dark history. Thank you, Eve, for your work. Friendly greetings.